Have you ever jumped onto your PC to do a quick thing, only to have to sit through a required software update that just takes forever? Wouldn’t it be great if your PC was always up to date, and you didn’t have to lift a finger? That fantasy is a reality with today’s discount software promotion, SUMo! 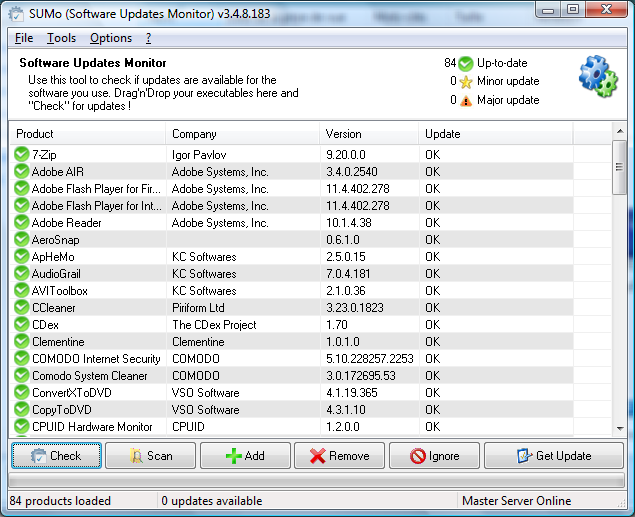 SUMo continuously and automatically updates all of the software on your PC, ensuring that you’ll always use the latest and greatest version of any program. With SUMo, you never need to hunt for a new version of software; instead, SUMo scans your computer, automatically builds a log of installed software, and then goes on a mission to detect and install required updates and patches as necessary. If you always have to have the latest and greatest software, you can even tell SUMo to download and install beta versions of software. Getting updates for an application you don’t use? Just add it to the Ignore List and SUMo won’t fetch it anymore! After you purchase SUMo it may be used indefinitely. SUMo is licensed per user, so if more people are going to use SUMo you will need to purchase additional copies. kristina User Thank you for your response Kyle. monster User eset did a blocking access for me at the all kcsoftwares apps, despite being source links. Kyle Katarn disregard warning from ESET, false posirtive. Joe Adinolf An absolutely fantastic program. I used Secunia PSI for years but this is much better. Have PRO on 4 computers. Still need one more license for one computer. Joe Adinolf Yes, the ESET warnings were really keeping me busy. - YEs, if you need > 4 PCs, you need more than 1 licence.... but you have a nice discount here which make it cheap ! Joe Adinolf Very true Kyle. I'll be getting another license. All 5 computers are now covered!